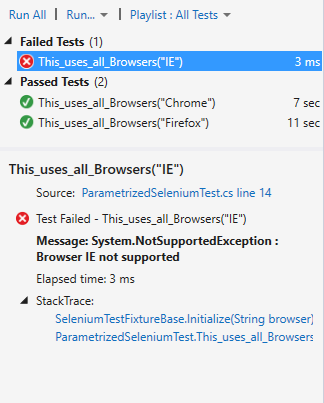 To run a Selenium test in a build vNext there are some modification to do apply to previous example. 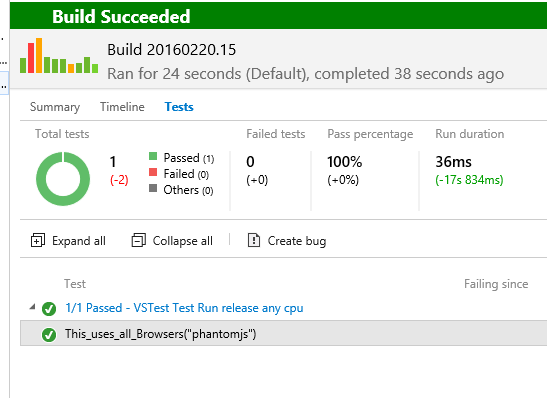 Let’s see how simple is running our Selenium Tests in a VSTS Build vNext. Using Phantomjs is just a matter of creating a PhantomJSDriver with Selenium WebDriver test and the game is done. 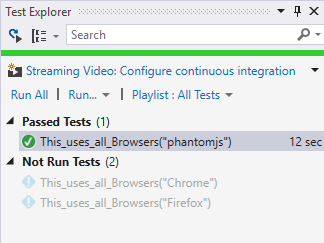 Now add “phantomjs” to test config file and you should be able to run the test. 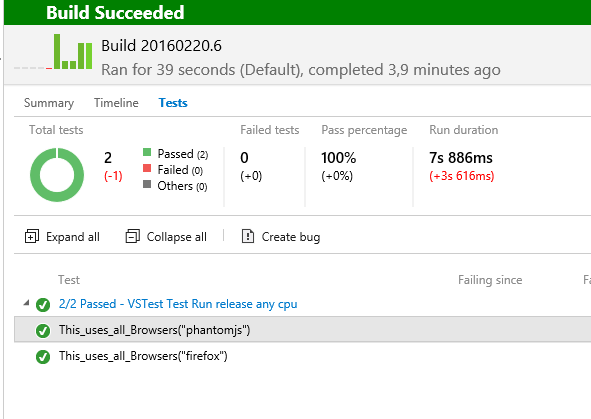 Figure 1: Selenium test that uses Phantomjs headless browser to run test. Now it is time to change the ValueSourceAttribute, to allow overriding the list of browser with an Environment Variable. 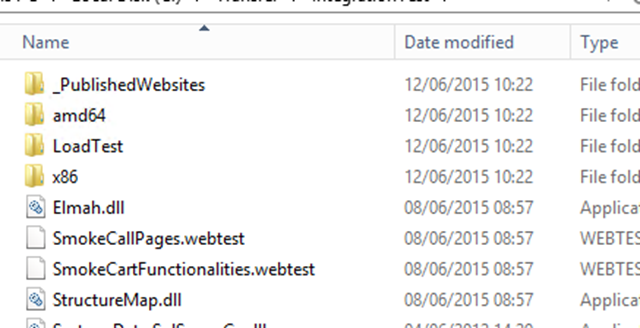 While the Json Configuration file to configure tests is a really simple and useful solution for developers, running tests on their machines, when I need to run tests on a bulid server I want to be able to specify the list of browser with a build Variable. Here is the new code of the ValueSourceAttribute that use that environment variable to find list of browsers to use. The only change is that the attribute searches an envorinment variable called SELENIUM_BROWSERSTOTEST to grab list of browser. If the variable is not present, it use json configuration file as showed in previous article. 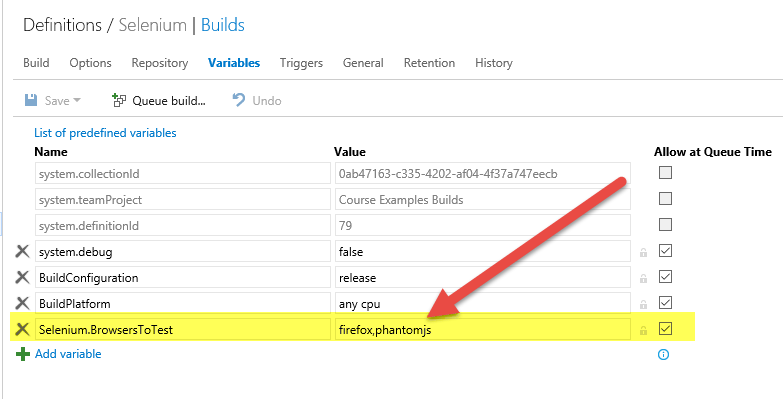 Now we can choose browser list directly from build definition. 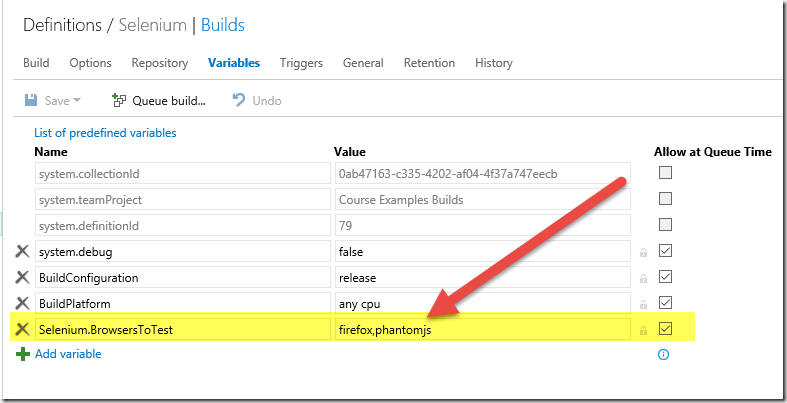 Figure 2: Specifying browser list with Build Variables. Previous build outcome of Figure 3 is obtained running the test with an agent that does not run as a service, because it should be able to launch browser and access UI. If I queue the same build with Hosted Agent, or with an Agent that is running as a service, here is the result. A couple of modification are worth of notice, the first one is that initialization of browser list is done in static constructor, and it will be executed once for each test run. Then, if the test is not executing in a UserInteractive session, the attribute remove all browsers except phantomjs, the only ones that is guaranteed to run without having access to a UI. With this simple trick we avoid to run tests that will fail because they could not run. To understand which browser can run with agent running as a service you can simply try to run all of them and verify which ones returns error. Actually some browser can run in headless mode (without UI) so they can be used even if the agent has no access to the UI, so use this technique to remove all browsers that does not supports this mode. To verify that everything works, I changed configuration of my Visual Studio Agent to run as a service instead that running interactively and queued a new build. Here is the result of the Tests. Parametrizing NUnit Tests is a new feature introduced with version 2.5 and this feature can be really useful in a variety of scenarios, but when it is time to use Selenium this is a killer feature. I’m not going to cover Selenium WebDriver component, but basically it allows to write tests that can drive a Browser to execute test against your web application. In this scenario a killer feature is being able to specify the list of the browsers to use in a way that is completely indipendent from your test. Thanks to the ValueSourceAttribute obtaining this result is really simple. First of all I create a base class for the test that creates different Selenium Web Drivers based on a string specified as argument. This is really trivial, and for this example I’m going to support only chrome and firefox. Then I create a json configuration file where I specify every parameter needed by Unit Tests. Using an external json file to specify parameters for your Unit Test makes trivial passing those parameters for every runner (VS, TeamCity, GUI, command line runner). This is a simple configuration file that contains only the list of the browsers I want to use. 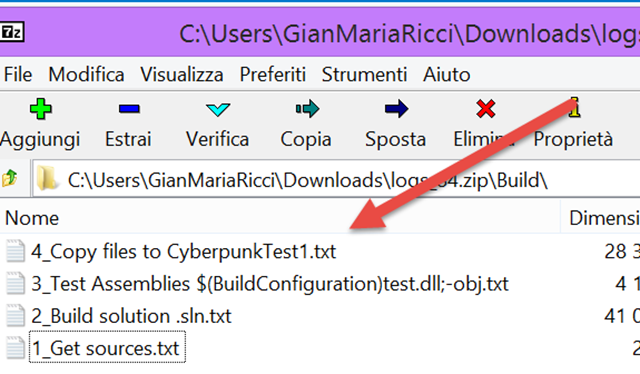 Remember to ask Visual Studio to copy this file in output folder when it changes. I’ve choosen Json because it is easy to write and easy to parse. Now it is time to create my attribute based on ValueSourceAttribute; it will read the above configuration file and provide the list of the browsers I want to use. Again, this is a simple and trivial class that simply looks for a testParameters.json in the test run directory and search for the Selenium.BrowserToTest array, that containing the list of the browser to use as test. Thanks to ValueSourceAttribute we can drive and parametrize the test with a simple external file. Thanks to those two classes, I can simply specify for each test the Browsers List I want to use. Using BrowserList attribute I’m asking Nunit to create an instance of that attribute to get the list value to be bind to that specific parameter. For each value a different test is created. Now if I build my project I can verify from VS Test Runner that indeed I have three different test to run. If I run the tests, as I’m expecting, the IE based test fails because I’ve not configured my test to use IE Driver. 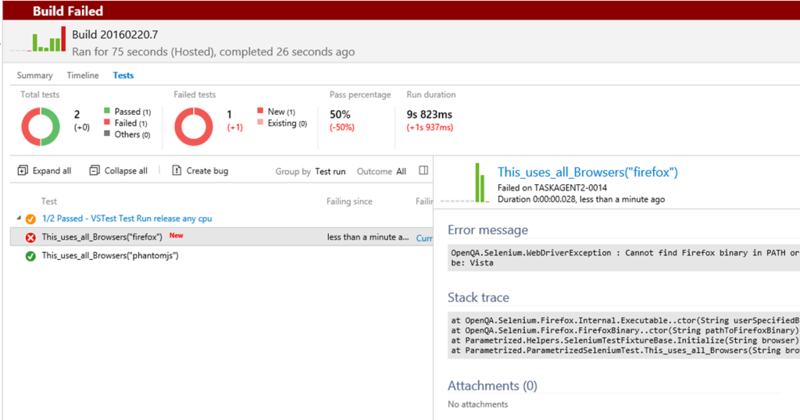 Figure 2: Test output with Visual Studio Test Runner. Now remove the IE from the list of Browsers to use in the testParameters.json and rebuild the solution. The IE version of the test now is disappeared from Test Runner. This technique does not depend on anyhthing, and can be used to run test with different configuration if you need (dev machine, different build machines, etc). Thanks to this technique you can specify whitch browser to use with a simple configuration file and this is a killer feature if you are planning to run test during the build. You can simply modify your testParameters.json file before running the test in your Build to choose which browser to use, or disable completely selenium testing specifying an empty array. With such a technique you can run the test and let the environment specify whitch browser are available to use for testing in that environment. 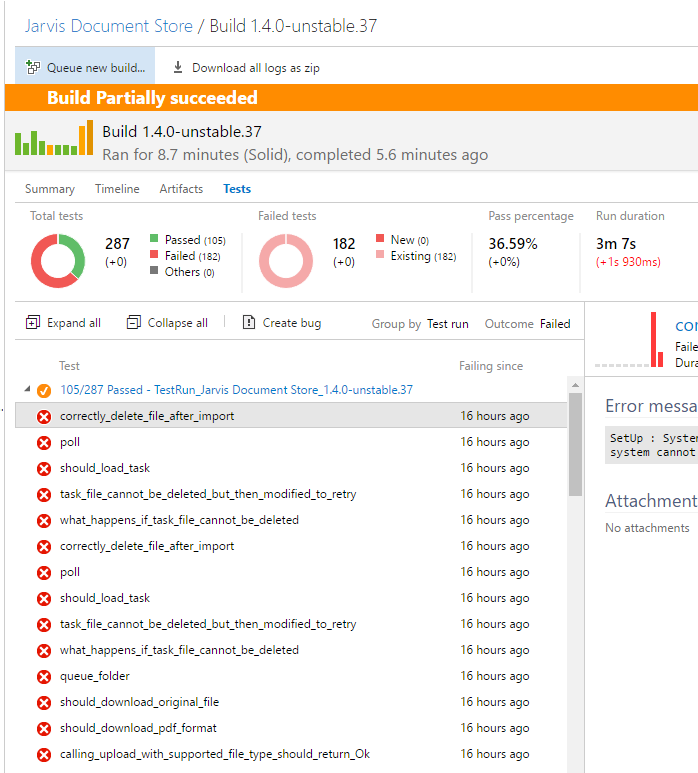 One of the most interesting trend of DevOps movement is continuous deployment using build machines. 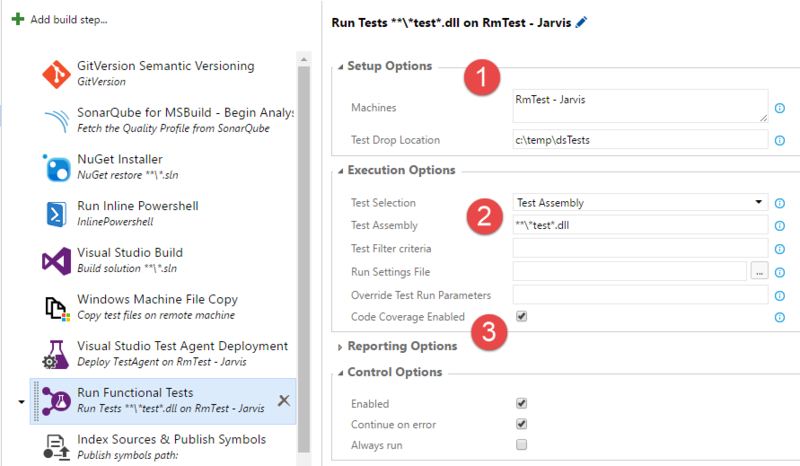 Once you get your continuous build up and running, the next step is customizing the build to deploy on one or more test environments. If you do not need to deploy in production, there is no need of a controlled release pipeline (Ex: Release Management) and using a simple build is the most productive choiche. In this scenario one of the biggest pain is moving bits from the build machine to target machines. Once build output is moved to a machine, installing bits is usually only a matter of using some PowerShell script. Thanks to Build vNext solving this problem is super easy. 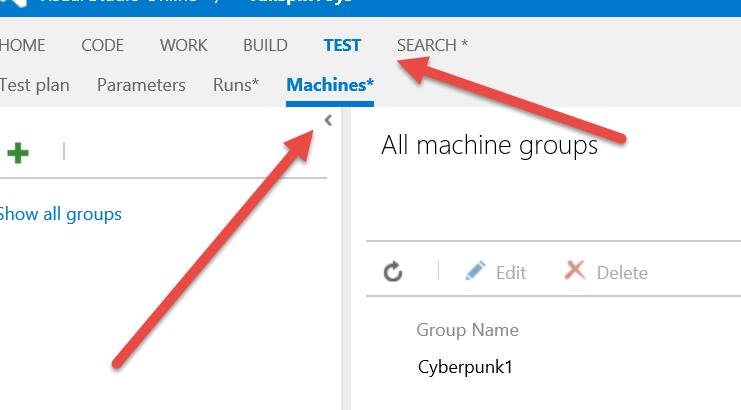 If you go to your visualstudio.com account, and choose the TEST hub, you can notice a submenu called machines. 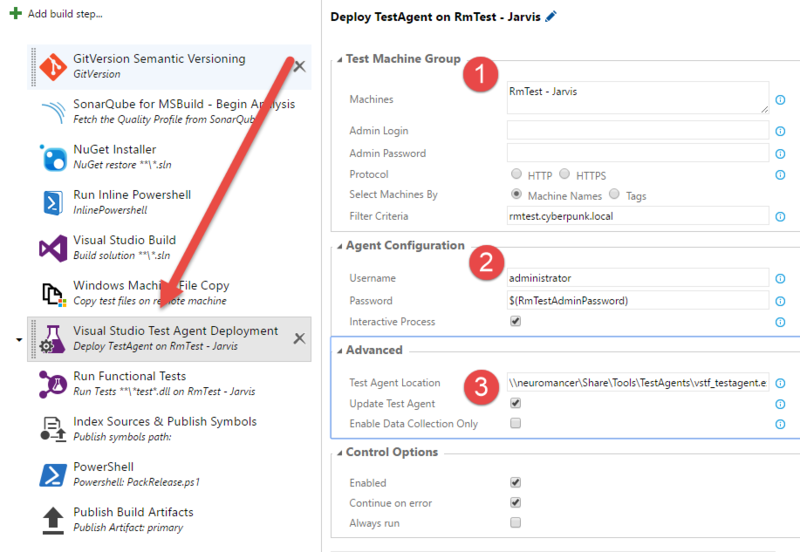 This new menu is related to a new feature, still in preview, used to define groups of machine that can be use for deploy and testing workflows. In Figure 1 you notice a group called Cyberpunk1. Creating a group is super-easy, you just need to give it a name, specify administrative credentials and the list of the machines that will compose the group. 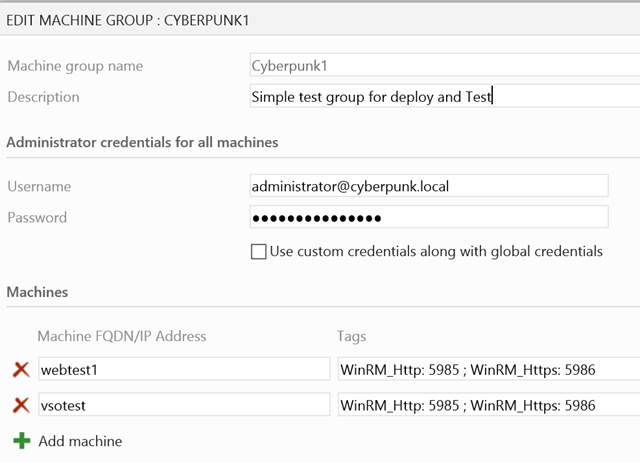 You can also use different credentials for each machine, but using machine in Active Directory domain is usually the simplest scenario. I’ve tested with an environment where both machines are running Windows Server 2012 R2, with latest update and file sharing enabled. 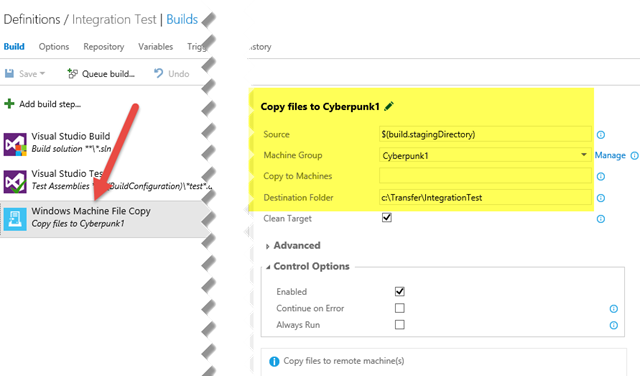 Once you defined a machine group, you can use it to automatically copy files from build agent to all machines with a simple task of build vNext. 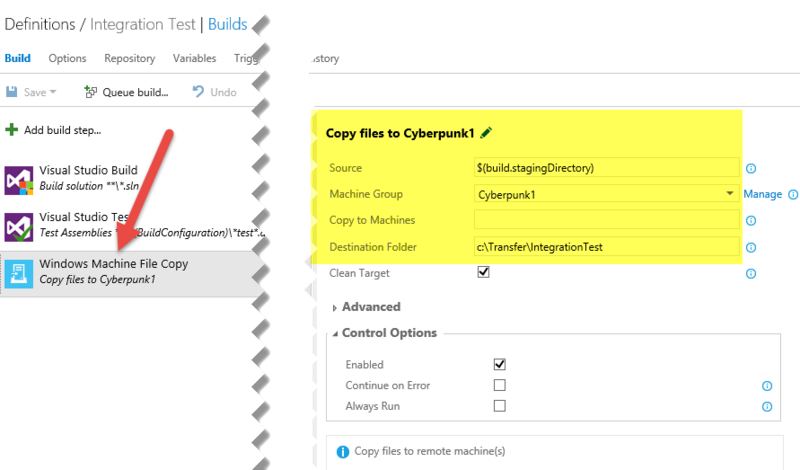 Thanks to this simple task you can simply copy files from build machine to destination machine, without the need to install any agent or other components. All you need to do is choose the machine group, target folder and source folder. 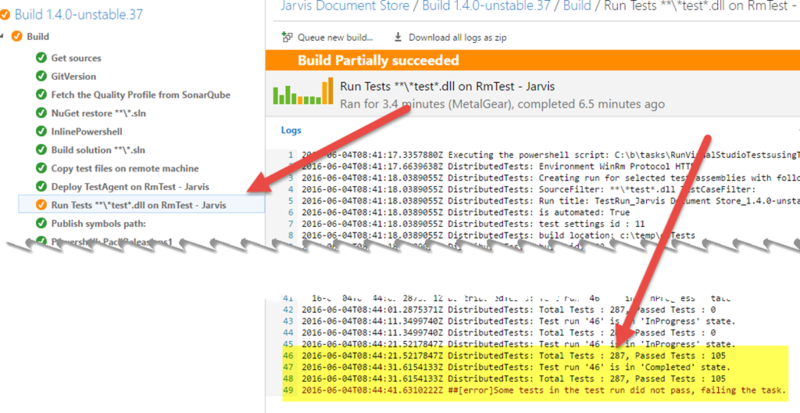 Opening the file 4_Copy … you can read logs related to the copy build step, to understand why the step is failing. Here is what I find in one of my build that failed. Failed to connect to the path \\vsotest.cyberpunk.local with the user administrator@cyberpunk.local for copying.System error 53 has occurred. 2015-06-10T08:35:02.5591803Z The network path was not found. In this specific situation the RoboCopy tool is complaining that the network path was not found, because I forgot to enable file sharing on the target machine. Once I enabled file sharing an running again the build everything was green, and I can verify that all files were correctly copied on target machines. 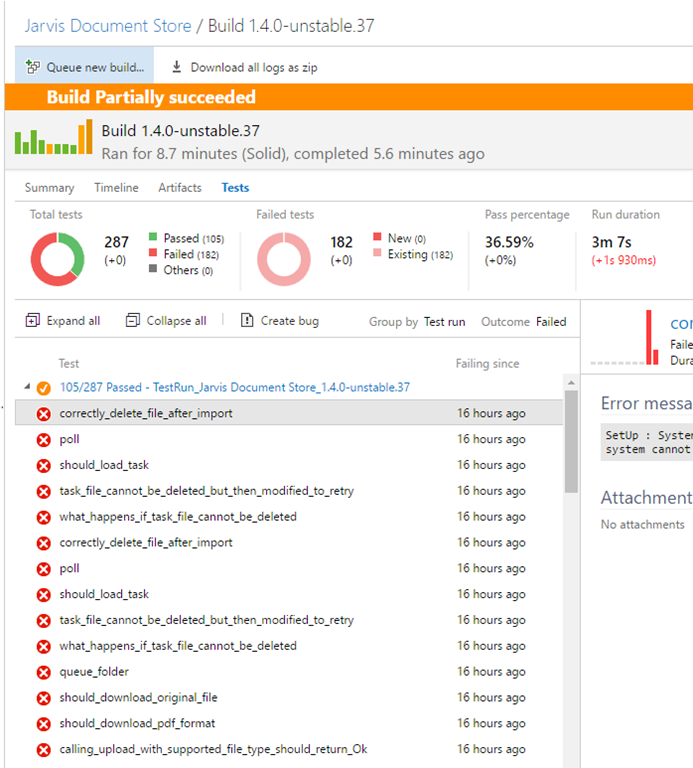 As a general rule, whenever a build fails, download all log and inspect the specific log for the task that failed. Figure 5: Sample application was correctly copied to target machines. In my first sample, I’ve used TailspinToys sample application, I’ve configured MsBuild to use StagingDirectory as output folder with parameter OutDir: /p:OutDir=$(build.stagingDirectory) and thanks to Windows Machine File Copy task all build output is automatically copied on target machines. Once you got your build output copied on target machine, you need only to create a script to install the new bits, and maybe some integration test to verify that the application is in healthy state.